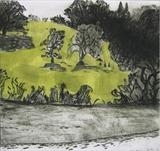 One of a series of prints drawn on the River Dart, of the landscape below Sharpham House in South Devon. 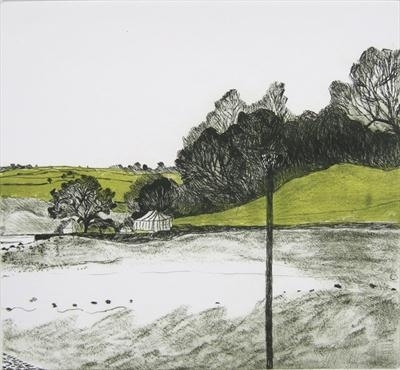 Part of a series of three images that can be hung together to make a triptych, this drypoint print is typical of Susan's landscape work. The colours are simple; a warm dark browny-green which is lightened by a paler and brighter grassy green. The marquee set up on the river bank lends the scene a focal point.